As I left the house for work on Thursday morning, I found a sign planted between the sidewalk and the fence at the end of my driveway. A simple corrugated plastic type, it promoted “Tree Trimming” and gave a phone number. Now I might have overreacted, but when I saw the thing, I got angry. I hadn’t had any tree work done. Neither had either of the neighbors. Nobody asked me if they could put a sign there. I don’t put signs there. So I got out of the car, pulled it out of the ground, and threw it in the trash can. Issue solved. Case closed. Done. I didn’t think too much about it until noon on Saturday, when my wife came home and told me there was a sign at the end of the driveway. Sure enough, the same guy had apparently planted an identical sign out by the street, although it was now on the other side of the driveway. And once again, I pulled it up and threw it away. As I write this, it’s Monday morning, and I’m wondering how many signs I’m going to have to remove before the tree man gets the message that I’m not letting him advertise here. I’m not angry. I’m not going to complain about him to anybody. But I’m not letting him put his sign in my yard. 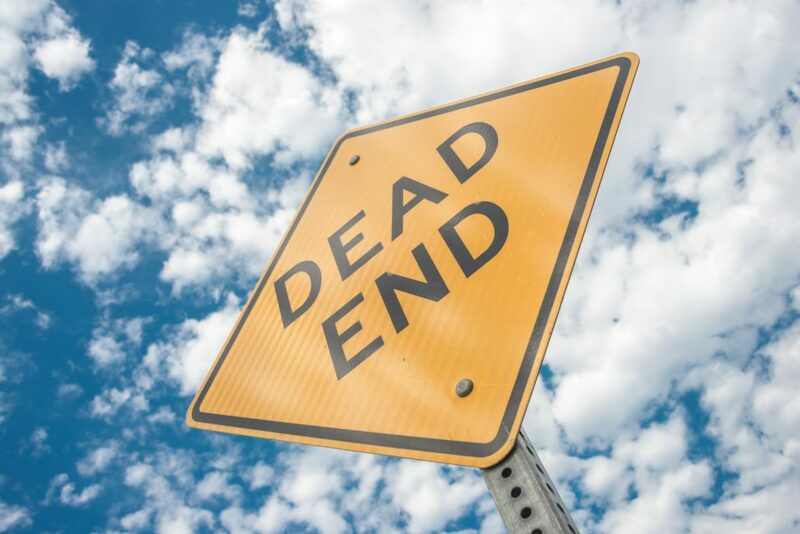 For him, this is a Dead End… Period. And yet I sympathize. I get it that the tree man is just trying to promote his small business. Signs are an inexpensive and effective way to promote your company, and the end of my driveway is a good spot. It sits across from a traffic light at a main intersection, and has a lot of visibility. I’m sure the guy just bought 100 signs and figures he’ll put them up all around town and just see if they stick. You see this kind of thing on highway off-ramps and other high traffic areas, but you see a lot less of them in residential neighborhoods because people (like me) don’t want you advertising your business in front of their homes. I think it’s kind of an aggressive tactic to put your signs up in front of someone’s house, yet I’ve known business owners who would do it (especially in their early days). It implies a “nothing ventured, nothing gained” mindset. For the signs that nobody removes, he gets good promotion. For the ones that get trashed, well they only cost about a buck, and he already bought a bunch of them. But if you’re going to apply this mindset, you’ve got to play this carefully. When will you reach a point where you’ve pissed people off enough that they take action? And what action will they take? Some people might report him to the city, or the BBB or the police. Others might call him directly to tell him to knock it off. And you don’t know when people will reach their limits. Some may have been calling after the first sign. Others might have been calling after the second. I might give him a call after the third, or I might just trash it again and see if he gets the message… we’ll see. In the end, I haven’t committed his name to memory or called him up to complain just yet, but he’s already got 2 strikes. And if I ever do get irritated enough to call him up over it, you can bet he’ll never get my business. It leads me to ask myself as a prospective customer, if he’s doing this, what else will he do as a contractor? Is his strategy with the signs an indicator that he’ll be tough to do business with? And what does it mean for yard signs? What’s your experience with yard signs? How would you use them? Are they great, or are they a bad investment? We only leave yard signs out in front of current clients home that we have recently completed work. We ALWAYS ASK for permission to leave up for one week. We always return to remove sign after one week. the signs do work and are a low cost effective solution to obtaining new work. if we do obtain new work from a neighbor due to view of sign or trucks I always provide a small discount, service, or something to the client that allowed me to put a Rain Rich sign on their front lawn. Thanks for the comment. What you’re doing sounds like what I’d expect from a courteous and professional company. I particularly see a lot of new sealcoating jobs (residential and small commercial lots) where the provider leaves a small sign. I’ve always just assumed they had permission and might have given a small discount or other incentive.